Special Saturday. 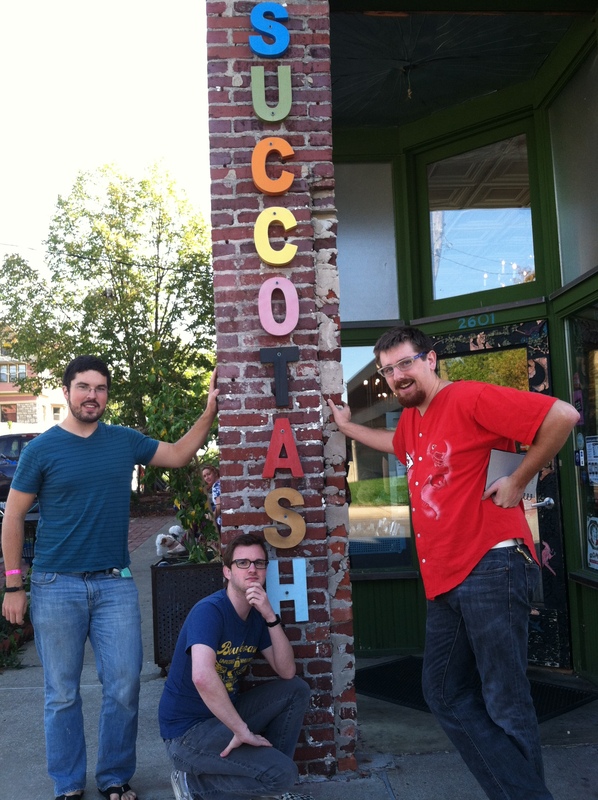 September 29, 2012 – 9:16 A.M.
Succotash is located at 2601 Holmes Street, Kansas City, MO 64108. Their menu is available on their website. They also have a Facebook page. Location/Environment: The location is in the middle of a mostly residential area, which makes it a nice find. Parking could be a problem on busier days or weekends, but usually not an issue. It’s a nice, upscale hipster brunchery; very eclectic and kitschy. For the size of the restaurant, there is quite a bit of seating. Previous couches have been replaced with more individual tables and seating. Overall, Succotash is a bright, colorful start to your morning (or afternoon)! Service: The servers are friendly and extremely knowledgeable about the menu. Feel free to ask them about their wide juice and beverage menu. There is a strong apparent camaraderie among the staff. They’re quick and efficient, always moving, weaving in and out of tables like a hive of worker bees. However, our service did falter at the end. We did wait over 20 minutes to receive our check. Our waiter’s focus seemed to leave the table, which isn’t a problem except we still needed to pay and leave. Menu/Selection: The first thing you notice is their fresh made organic juice section. They have a nice array of coffees, teas, sodas and even a few specialties, like the Little Richard (Mexican Coca Cola & espresso) and Stevie Wonder (Root Beer & espresso). They also feature $2 bottomless coffee. Succotash features a full brunch and lunch menu. Anything from salads to omelets to griddle foods. They have very large pancakes for very big appetites. They’re also vegan and gluten-free friendly. 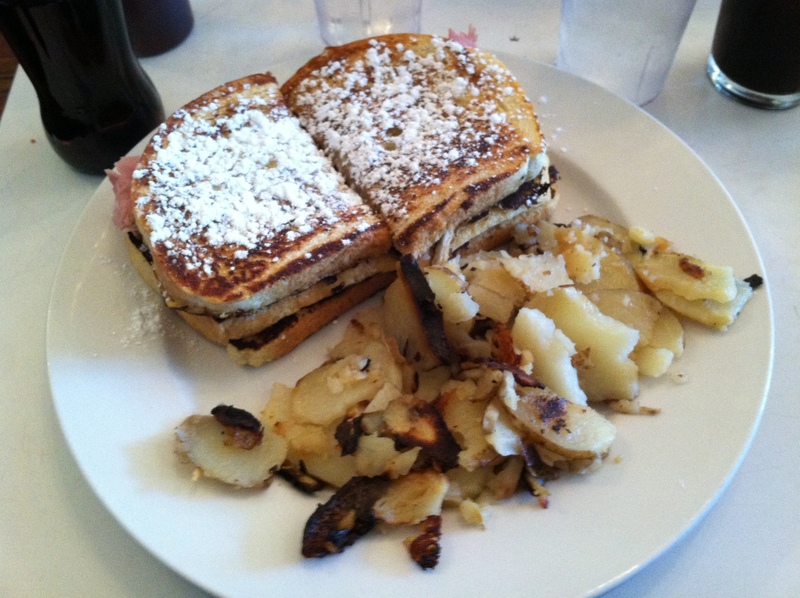 I’m not going to beat around the bush, this french toast was dynamite. The bomb. Incredible. I’m always worried when I get french toast that I’m not going to be full, and yet I always get there. These six pieces were the perfect amount. The texture was exceptional, the flavor was buttery and milky, almost melt in your mouth. The butter was a healthy portion, the perfect amount for spreading across each piece. 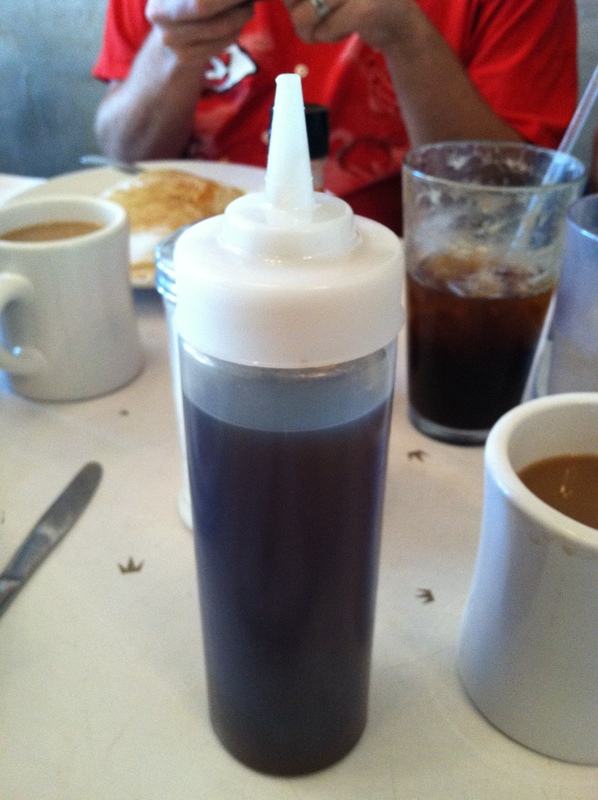 Succotash features syrup in a squeeze bottle, much like the classic red ketchup bottle (see below). I love it! It isn’t warm syrup, but it’s a convenient, clean way to dispense your sweets, and it works like you wouldn’t believe. The bottomless coffee was a perfect pairing with these delicious slices. I was left satisfied, full and ready for a nap. 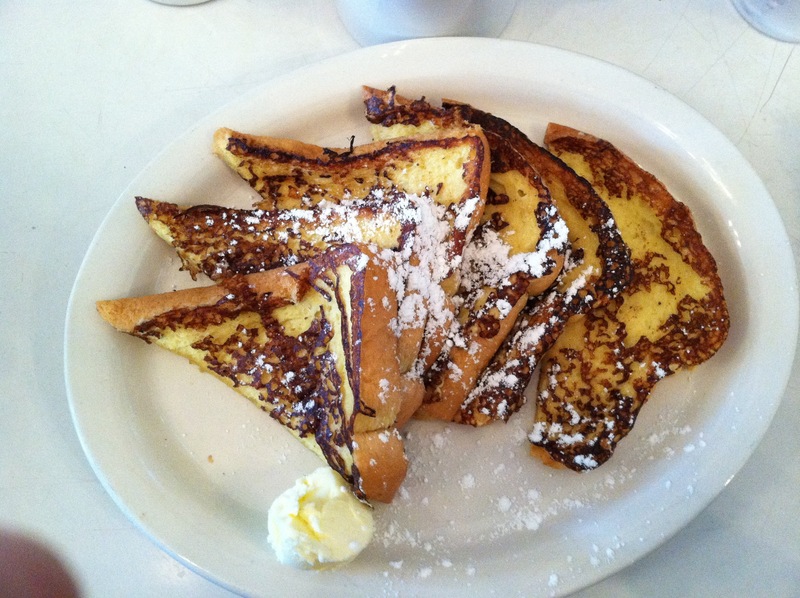 The french toast is $8 with bacon & eggs, or $6 without. This is not your next door neighbor’s burrito. This burrito has love in it. 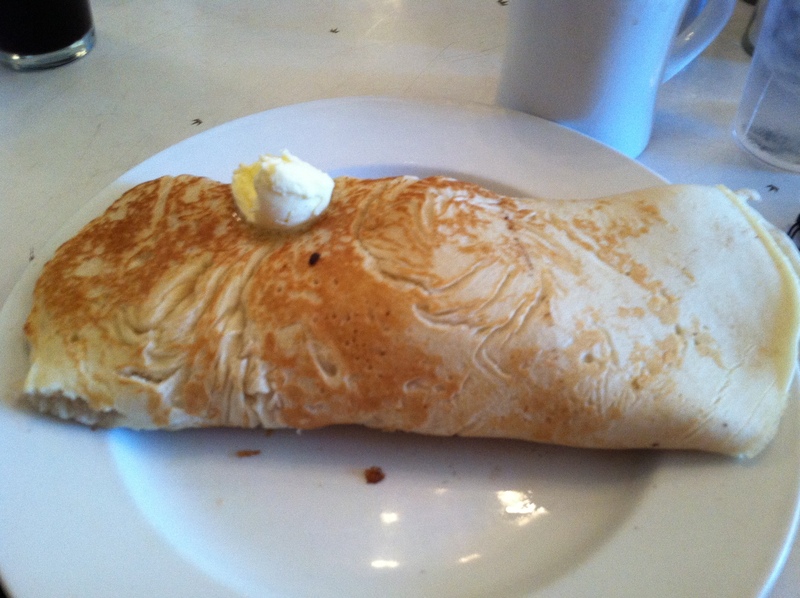 I like to think of the love was named after the foot in diameter pancake. This pancake is the what holds this meal together, literally and metaphorically. The contents of this burrito are crispy bacon, scrambled eggs, and cheese. This burrito is everything you usually have for breakfast wrapped up in a loving burrito. I am a big fan of this burrito of love. There was only one thing that I struggled with in this burrito, and that was the bacon. The bacon was so crispy that it was hard to cut reasonably. I had to take the bacon out and eat it separately; which isn’t a bad thing at all, it’s bacon. The rest of this meal was incredibly enjoyable. The pancake was perfectly cooked. I am astonished with how well it was cooked, due to its size. The burrito of love is conveniently priced at $7. First off, I would like to formally introduce myself. My name is Aden “Dudesky Lawyer” Eilts. I am a best friend of Jared, so it is completely necessary that I should get a guest spot on the infamous Panclog. I would like to thank George W. Bush, or Dubya, for allowing me to be here today. I was honored to be a part of this and will cherish these memories forever. I pulled up to Succotash promptly at 9:09 AM to see Jar-Bear and company strolling up to the door. We exchanged greetings briefly and got down to business. Richard.” The description read as follows: “icy cold mexican coke w/ a shot of espresso. Will make you go Whooooooooo!!!! !” I definitely said “Whooooooooo,” however, roughly eighteen minutes later, my stomach was saying something much different. Although I appreciated the Little Richard experience, I will not be partaking in that adventure again. fusion of flavors I have tasted on a sandwich. That is saying a lot coming from an experienced sandwich maker like myself. Now, you might be thinking, “how could this meal get any better?” Well, it did. So, our waitress came up when we were finished with our meal and sarcastically asked if we were interested in dessert (as if she thought we couldn’t handle it). I explained to her that my birthday had been two weeks earlier and I never received any birthday cake. 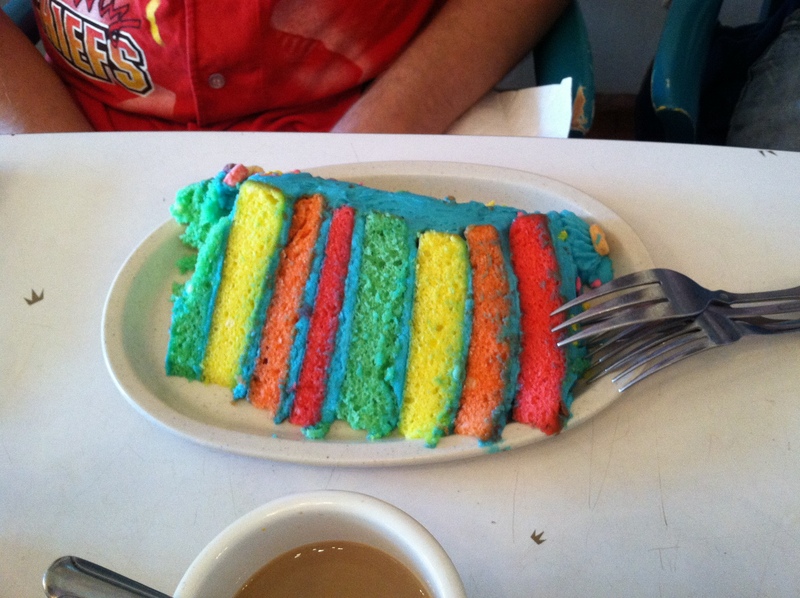 She whisked away from the table and quickly returned with a piece of their famous 8-layer citrus cake, topped with Froot Loops. Absolutely free. Mind. Blown. The cake was moist and the flavor was magical. And just so you know, we finished it, as if that was even a question. The price of the meal was very reasonable. It wasn’t the cheapest breakfast I have had, but for what I got, the price was very good. If you are looking for a fun, eclectic place to grab some grub, this is the place. From the juice/espresso bar, to the brunch menu, to the extensive lunch menu, to the friendly and prompt wait staff, I was thoroughly impressed with this establishment. This is definitely on the top of my list for breakfast in the Kansas City Metro Area. Price: Succotash is decently priced, about what you’d expect for a nicer, unique breakfast spot made for foodies. You could spend a lot and try a variety of items, or get by pretty cheap with a simple breakfast. Overall: Succotash is a type of place you’d love to bring out-of-town friends to show the unique culture that is Kansas City. It’s a great atmosphere and the food is superb, we would love to return. Our wait at the end of our meal is not the norm, and shouldn’t be expected, but it was unfortunate. You can also follow Aden on Twitter and Tumblr.